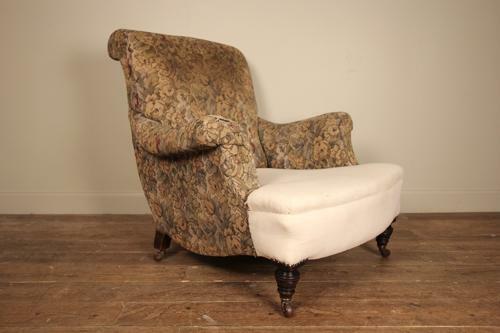 A superb country house chair with a shapely profile and large proportions, raised on Walnut turned legs and retaining the original brass cup castors. Firm condition in need of a new top coat or for use with a Morris & Co loose cover as shown. English, Circa 1850. Dimensions: Height: 89 cm - 35 Inches, Width: 76.25 cm - 30 Inches, Depth: 101 cm - 39.1/2 Inches.